I was starting to wonder if the redbud tree was dead. 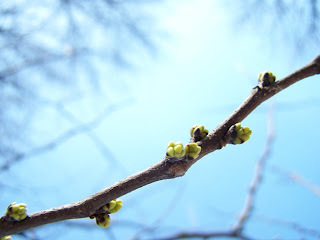 Other redbud trees in the neighborhood have had large buds on them for a couple of day. But today, I noticed a small change in the tree. Can you see it? I am excited to see how much the tree changes in the next few days. 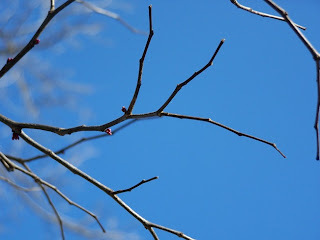 Walking today we saw a red bud with green buds. I think this tree will have white flowers.